If you take up road riding in your 30s or 40s as many of us do, one area you need to focus on if you want to advance, is improving your road bike skills. As children most of us rode a bike, but the majority of us were not formally taught, so we didn’t have the chance to learn any bike skills and this particularly applies to women. 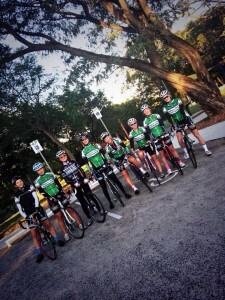 Cycling clubs offer training skills coaching in formal and informal ways. The informal is the advice you are given on club training rides. At my cycling club LACC we have a weekly women’s ride which is targeted at women who might be new to cycling and want to learn about bunch riding. It’s not a formal coaching session but we always make sure that new riders feel comfortable and welcome and learn a few tips along the way. There are a number of clubs around Australia that are particularly welcoming to women like St Kilda Cycling Club in Melbourne, Kangaroo Point Cycling Club in Brisbane and the women-only Skinny Lattes in Adelaide. As well as informal tips given on rides, there are workshops, skills days, training camps, etc that are offered through clubs and cycling groups. If you’re fairly new to riding and want to learn and ride with like-minded women then look up Wheel Women run by the awesome Tina McCarthy. Share with everyone else how you have been improving your road bike skills. Contact us via comments or the Women Who Cycle facebook page. I would like to mention the road cycling group that is formed in Cairns called She Spoke. Access is via Facebook. It is a FREE group that has 3 ‘levels’ of ride from the ‘Guns’ to the beginners. Every Thursday morning from the Lagoon. 5am is first rollout. Check us out!